Riot police in Athens had to intervene in clashes between Greek soccer club fans heading for a game and the Pakistani community celebrating a religious holiday marking the Prophet Mohammed’s birthday. Tear gas and stun grenades have been deployed. Brief but ferocious clashes happened in the center of the Greek capital on Sunday, AP reported. While there have been no serious injuries or arrests, law enforcement had to use tough anti-riot methods to stop the violence. 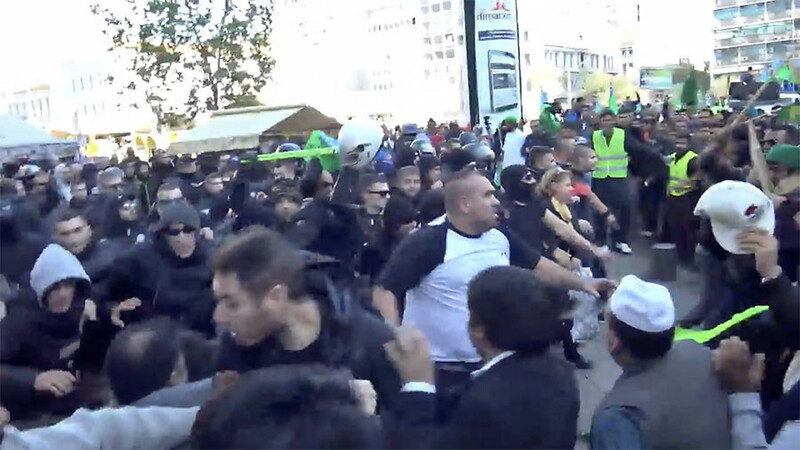 A video from the scene shows utter mayhem in the street as hooligans trampled on Islamic flags, while Pakistanis try to defend themselves, with some fighting back. Members of the local Pakistani community were celebrating the birth of the Prophet Mohammed with a procession in one of the squares in downtown Athens. At the same time, supporters of the Thessaloniki PAOK soccer club were in the area, heading for a league game. Although escorted by police to a sporting venue, the hooligans began insulting the immigrants and attacked them, AP reported. There were around 200 fans, while some 800 people took part in the Muslim march, according to local media.